The creator of Orbiter Space Flight Simulation ,Dr. Martin Schweiger, posted this YouTube video yesterday on the forum. I tend to stay away from beta versions of s/w...too much like work. I tend to think a lot of ATM s/w is released so we field techs can finish finding all of the bugs The video shows the current progress for the next major release/version of the simulator. My jaw didn't really drop open until 31 seconds into it. I can't wait to start using it...especially for further YouTube videos of my own. 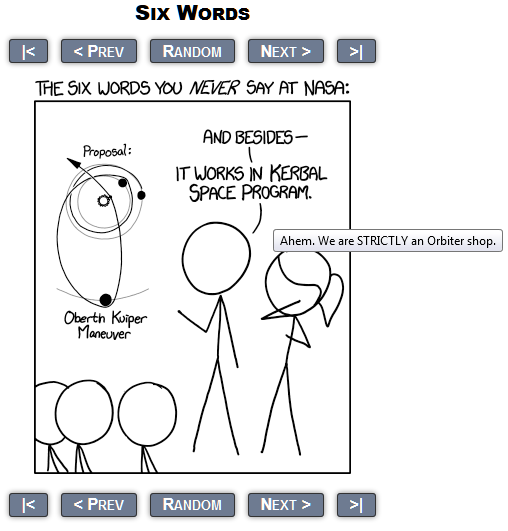 OK...so I've done this bit with Orbiter about 3.5 years ago while developing the Apollo 8 Scenario Pack for AMSO. I've also blogged on the iconic photo known as, "Earthrise", before too. See here. But the people at Goddard Space Center have come out with a new video based on new findings. 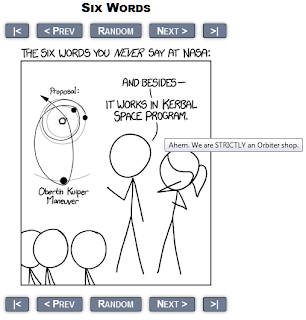 Six words that you never say at NASA. This is the equivalent of being nominated, or actually winning, a Nerd Oscar. Eat your heart out, Sheldon Cooper! "It all started when I found the green meteorite." 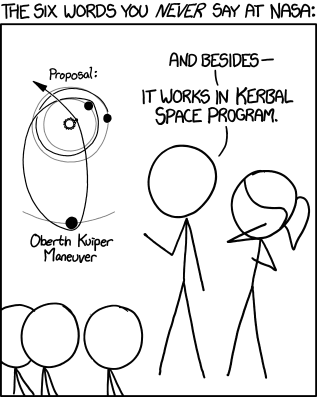 Seriously, this post idea started about 2 weeks ago after reading a thread on Orbiter Forum. It was started by Bloodworth, and discussed food franchises on the Moon - specifically, "on our lunar bases." I was flattered to see, "Niven's Nachos", on the list. Not quite so with his entry for "Jules Verne Vegan Cafe". For you, Dear Reader (if any), not in the "know", Lunar Base Niven resides in the lunar far side crater of Jules Verne. What really intrigued me was Pipcard's entry. After viewing the commercial for Domino's Pizza, Japan, and doing a little background research, I thought I'd add to this Internet meme (however old and/or short lived it may be). 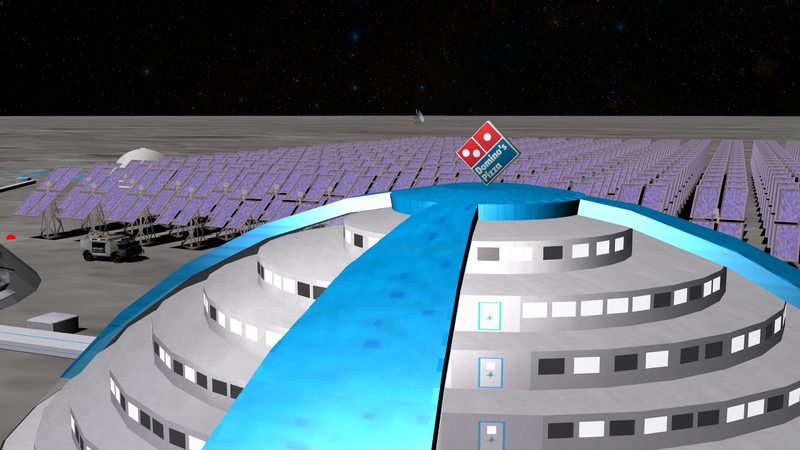 I think that it is a mere publicity stunt in reaction to Pizza Hut's first delivery to the International Space Station. Estimates for this project are $21 billion...their pizza just isn't that good! THIS ISN'T an update to my add-on, BTW. Above view is looking roughly south from the base. 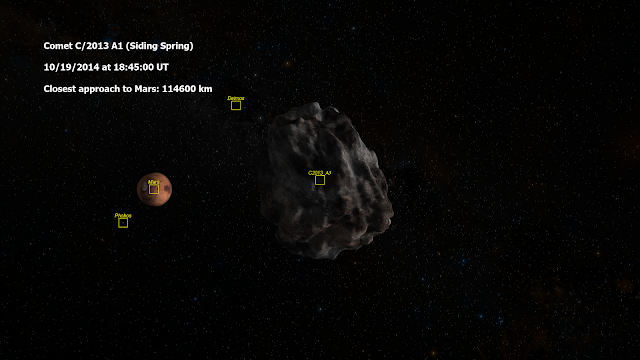 The screenshot above was generated using the freeware space simulation Orbiter. It depicts Comet C/2013 A1, aka Siding Spring, during its closest approach to Mars on October 19, 2014. Also used to generate the above screenshot was the Horizons Web Interface, maintained by the Jet Propulsion Laboratory at the California Institute of Technology. I generated the ephemeris with this web interface, and then plugged the numbers into an Orbiter scenario. There's only an observational arc of 211 days - so there WILL be a really decent fly by - with enough refinement to the projected orbit (for now) to say it WILL NOT hit Mars. Stay tuned, Dear Reader (if any). As new observations over time refine the orbit of this comet, I plan to update the screenshot and/or post a short video derived from an Orbiter scenario. 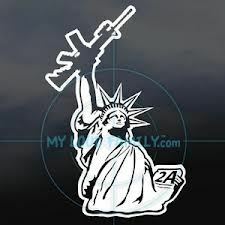 Credit to Dr. Richard Gran, director (ret. 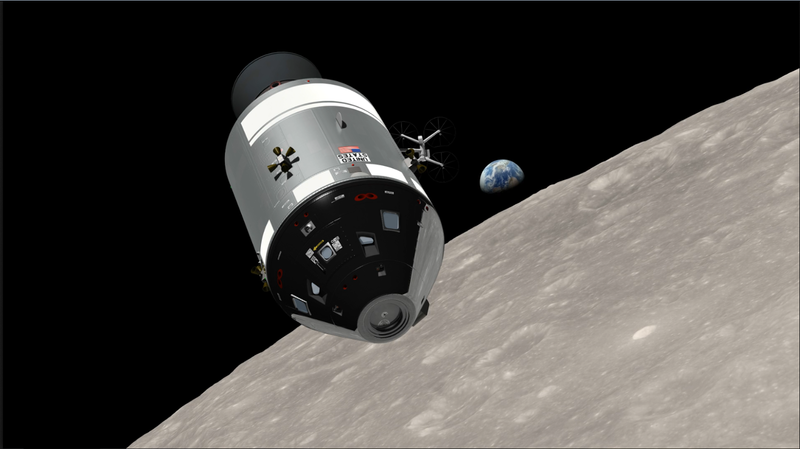 ), Advanced Concepts, Grumman, and member of the Apollo Lunar Module Digital Autopilot design team. The creation of a model that can be manipulated logically to decide how the physical world works. Excellent video on the subject. First of all, the emphasis should be on the phrase, "as a last resort."